The Painkiller is one of the many popular tiki cocktails created in the mid-20th century. 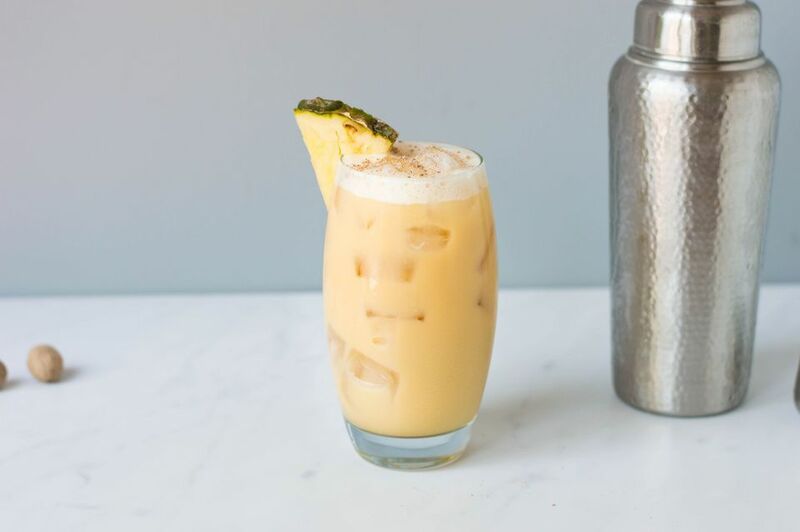 It's a fun and fruity mix, made of pineapple, orange, coconut, and a bold rum. Perfect for a sunny day on the beach or a casual afternoon in the backyard, the recipe is simple and the drink quite delicious. This cocktail typically calls for "Navy Strength" rum, which is high-proof and often a blend of rums from multiple Caribbean islands. It was developed when the British Royal Navy patrolled the seas and sailors were allowed a daily rum ration. Strain into a chilled highball glass filled with fresh ice. Sprinkle grated nutmeg on top. Though this recipe is the most common, there are a number of variations. Some use just 2 ounces of pineapple juice and others prefer to simply add more rum. As with all cocktails, it's a matter of personal preference, so mix it how you like it. As you will see in the backstory of the Painkiller, Pusser's Rum has long been the rum of choice for the Painkiller. It's a nice rum and a good example of the more traditional Royal Navy style of rum. The brand's Original Admiralty Blend (Blue Label) is the most popular option, though they do offer a couple of others. However, it is not your only option. British Royal Navy Imperial Rum is touted to be the most authentic among navy rums and it makes a fantastic Painkiller. You will find other brands available as well. If you do not have a navy rum, choose a full-bodied dark rum for this drink. In rum-loving tiki fashion, you can also mix two styles of rum, which some believe may be truer to the original Painkiller. Whatever you choose to pour, it's hard to make a bad Painkiller. You'll find you enjoy some rums better than others, but finding that perfect combination for you is half the fun. The original Painkiller was created at the Soggy Dollar Bar in the 1970s. The hotspot on the British Virgin Islands was owned by Daphne Henderson. With no dock on the beach, patrons had to swim to shore, getting their money wet along the way. This inspired the bar's name. The Painkiller quickly became known as the drink to have at the Soggy Dollar and it became famous in the islands. The recipe was a well-kept secret, but everyone enjoyed it. When Charles Tobias, who would found Pusser's Rum in 1979, befriended Henderson he tried to figure out the secret recipe. As the story goes, Tobias recreated the drink almost exactly, though people at the Soggy Dollar enjoyed his slightly less sweet version of the bar's signature mix. The drink took off and Tobias ended up trademarking the drink name as Pusser's Painkiller. As you can see from Pusser's website, it is the exact recipe seen here. The recipe spread and it quickly became a modern classic in the tiki cocktail scene. Bartenders were mixing up Painkillers, drinkers were enjoying the fruity concoction, and all went well. That was until a pair of well-known New York City bartenders decided to open a tiki bar called Painkiller. They also offered the namesake cocktail made with another rum rather than Pusser's. This spurred a trademark lawsuit brought on by the rum brand which ended in the venue changing its name and a bit of an uproar in the bartending community. All of this brought up the question of whether anyone can trademark a cocktail, whether that be the name itself or the entire recipe. As the story unfolded in 2010 and 2011, other bartenders came out in support of the NYC establishment. Several boycotted the rum and quite a few purposely promoted Painkillers with any rum other than Pusser's. Though the story of the Painkiller does not change the appeal of the drink, it is an interesting case of who can "own" a cocktail recipe or name. It's not the first case in the courts as we've seen similar arguments surrounding the Bacardi Cocktail and the Dark 'n Stormy. How Strong Is the Painkiller? The Painkiller falls into that category of potential "hair of the dog" drinks. Like the Corpse Reviver, it gives the illusion that it might help out on those days when you are plagued with a hangover. Whether or not that's true is up for you to decide. However, do watch out because this tasty drink can catch you off guard. As it stands in the recipe and if we were to pour Pusser's U.S. offering of their Blue Label (84 proof), the Painkiller ​weighs in at 10 percent ABV (20 proof). This is nothing compared to cocktails like the Martini (60 proof), but sweet drinks, hot days, and summer sun can quickly get you drunker than you expected.